One of the top quarterbacks in the NFL, Aaron Rodgers has already carved out his own legacy in Green Bay. His success combined with the strong fan base of the Packers puts Aaron Rodgers rookie cards among the most pursued options in the hobby. 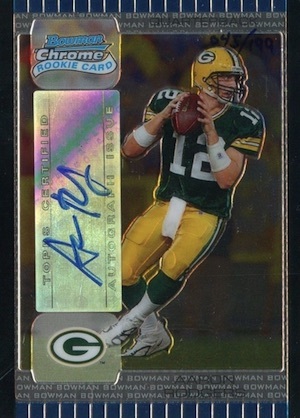 Although he did not assume the starting role until 2008, Aaron Rodgers rookie cards came during his first season in 2005. With over 40 choices, it is easy for collectors to get overwhelmed. 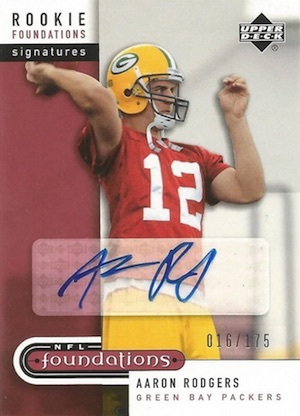 The following list looks at 15 of the best Aaron Rodgers rookie cards, including all of the main autographs. Shop for Aaron Rodgers rookie cards on eBay. While Aaron Rodgers has certainly not locked his name in with the greatest quarterbacks of all-time, he is well on his way since taking over for Brett Favre. Another title or two is not out of the realm of possibilities, and if he can add to his résumé, it would place Rodgers in a special class and push his already expensive rookie cards much higher. In addition to the key rookie cards covered below, view a complete Aaron Rodgers rookie card checklist in our detailed player profile. Topps Chrome has long been a prime spot for rookie collectors. 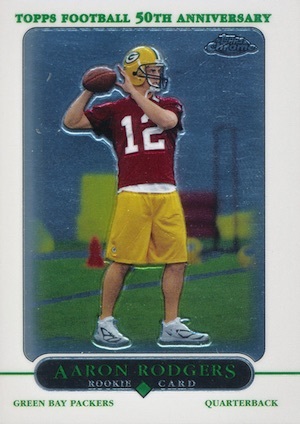 For fans of Aaron Rodgers, 2005 Topps Chrome is one of the most popular base rookie options. The familiar Chrome look takes a slight deviation with the large white border. While the base card has strong values, Refactor parallels are a big draw, as well, especially the Gold Retro Rookie Refractors (#/50). There is also a signed Gold X-fractor parallel, numbered to 399. 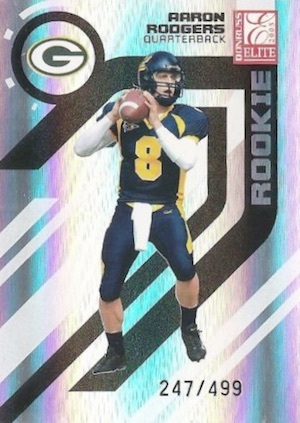 Despite the college image and loud design, 2005 Donruss Elite offers a great base rookie card for Aaron Rodgers that is limited to 499 copies. Several die-cut parallels add to that total and offer increased rarity. Like Chrome, there is also a signed version for Elite, numbered to 125. The rarest base Aaron Rodgers rookie card without a signature, 2005 Leaf Limited is numbered to just 250. The darker background puts the focus on the image of Rodgers and makes the card pop. There are also several shiny parallels that are even more limited. 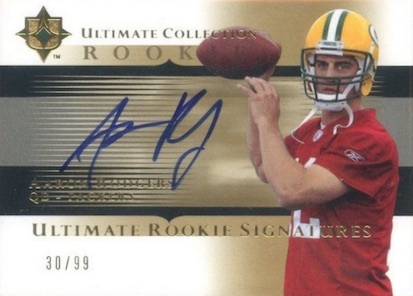 Any Aaron Rodgers rookie autograph, especially one numbered to only 99, would normally be an amazing option for collectors. However, as seen in the card below, the autograph was signed on a fabric strip and inserted into the card. The end result is not ideal as autographs like this never seem to come out clear and easily fade over time. 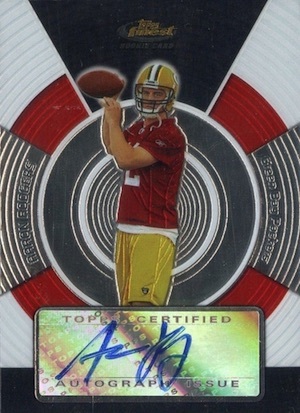 Still, it is one of the rarest signed rookies for Aaron Rodgers, so there will always be interest and value. 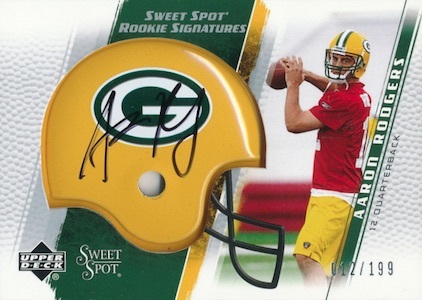 Another alternative to a sticker signature, 2005 Sweet Spot goes with a signed Packers mini-helmet. The autograph itself looks good, but the logo on the helmet makes it harder to see. For those that might be unfamiliar with the set, Foundations is an Upper Deck brand from the first half of the 2000s. It gives Aaron Rodgers collectors a solid rookie card with a sticker autograph and lower print run. While the clear sticker makes for a better look than the foil style, the overall design is a little bland. Pristine was another brand that had a short run at the start of the new millennium and the 2005 release marked the final edition. 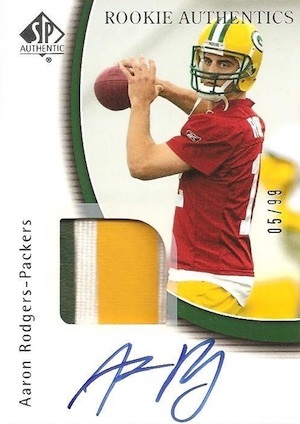 The low print run makes it an appealing option, but it is a little bizarre that this Aaron Rodgers rookie card could not find the space to include his full name and simply listed him as "A. Rodgers." A staple in collecting for many years, the 2005 Bowman's Best design is hurt by the angled layout and the overlapping text. 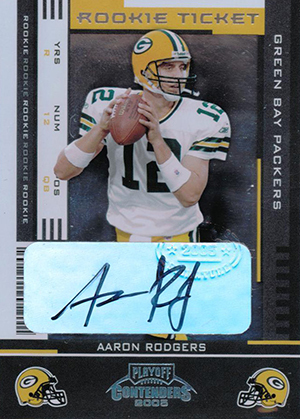 The end result means the foil sticker signature for Aaron Rodgers is crooked and the name is hard to read. Still, as a signed card from a popular brand with a print run of just 199, this card sees solid interest. 2005 Finest has Rodgers squarely in the crosshairs of a bullseye design. 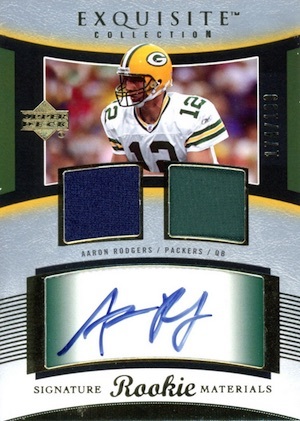 The brand power of Finest allows it to overcome the highest numbering of any autographed Aaron Rodgers rookie card. Somewhat surprisingly, that is all you get as there are not any Refractor parallels other than the Printing Plates. Rather tame for SPx, the refined 2005 design offers one of the most appealing looks of all the cards on this list. 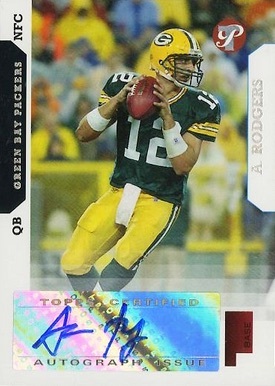 However, the rookie card for Aaron Rodgers would occupy an even higher spot if not for the sticker autograph. A gold Spectrum parallel is limited to just 25. Loud and unapologetic, the 2005 Bowman Chrome Aaron Rodgers rookie card stands out for a few reasons. First, the hand-numbering is an odd choice and is harder to spot. Also, the sticker autograph is applied vertically on the card, which seems to conflict with the design. Several Refractors parallels are available, but the Bronze (#/50) is the only one that seems to show up. 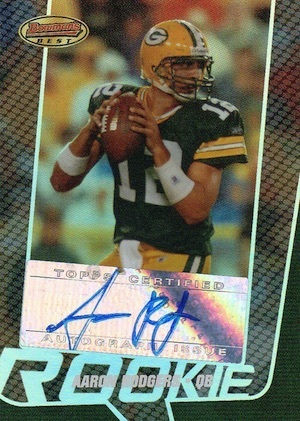 A large on-card signature makes this one of the ultimate Aaron Rodgers rookie cards. The design is also impressive. A limited print run means that there are not many of these available at any one time and the prices reflect the strength of the card. Normally, a card that has one of the highest print runs on the list is unlikely to be among the top cards. 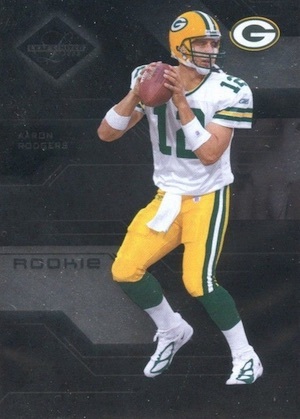 But the Contenders Rookie Ticket cards are not just any rookie option and this Aaron Rodgers rookie card is easily one of his most popular and valuable releases. 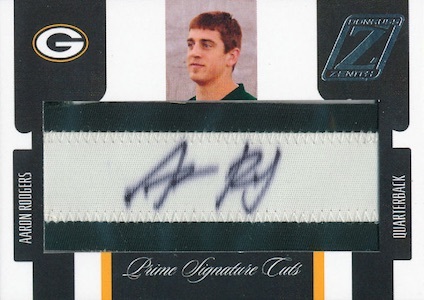 Although the card is not numbered, the print run was revealed to be 530 copies, making it almost twice as plentiful as other Aaron Rodgers autographs covered here. Despite this, ungraded cards still normally go for over $1,000. While Exquisite is known for quality and design, the first football release of the ultra-premium product is arguably the weakest. The layout is a little disjointed and the trapped autograph is not quite the same as an on-card signature. But for collectors, none of that matters, and the card regularly sells for around $2,000. Simple and elegant, 2005 SP Authentic brings collectors the top overall Aaron Rodgers rookie card. The on-card autograph is further enhanced by small relic swatch and a print run of only 99. Expect to pay many thousands of dollars if you want to add one of these babies to your collection. Hello, I am an avid fan of Aaron Rodgers (after Brett Favre) and looking for a collection of rookie cards. I am having a hard time finding the 2005 Score version with Adrenaline /399. Do you know the cost and location where this card can be found? Thanks for any help.